Arriving first in the 1977 Bachmann catalog is the familiar CB&Q example. This model was featured in the company's Empire Builder train set that served in the line for about a decade. Though there is no outward apparent difference, for 1980 Bachmann adds Electronic Chug-Chug and Steam Whistle to the Northern. The Burlington example gets the most exposure of the Northern 4-8-4 models in Bachmann's catalogs. It is on the cover of the 1978 catalog and as of that year, the CB&Q example is what it used in the Locomotives section for illustration. Listed as both "new" and as "a Bachmann Exclusive" is the Northern 4-8-4 steam engine in the company's 1976 catalog. For its first appearance this model listed at $50 and was available in two roads (Santa Fe and Union Pacific). 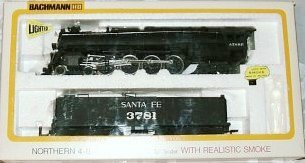 The Santa Fe Northern adds an example with Electronic Chug-Chug and Steam Whistle in the 1980 catalog. Along with its Santa Fe model, this Union Pacific Northern 4-8-4 are the first two offerings of this steam engine in the Bachmann HO-Scale line. Bachmann's Northern 4-8-4 steam engine has an N-Scale counterpart. The N-Scale example appears in catalogs back to at least 1969, while the HO-Scale Northern would not be added until 1976. 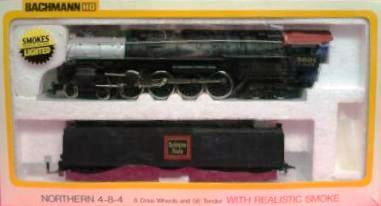 Though not stated in the 1976 catalog, "with Realistic Smoke" is featured with the model beginning in the 1977 catalog. The 1978 catalog lists the retail price for the Northern 4-8-4 at $55. The Northern moves up another $5 in 1979 to $60 retail and is joined that year by a Texas 2-10-4 model. The Bachmann Texas 2-10-4 appears to share its boiler's tooling with the Northern example. The 1980 line includes a revised Northern offering that features Electronic Chug-Chug and Steam Whistle. The 1982 catalog presents new stock numbers, though the models don't change in Bachmann's line. The 1983 Bachmann catalog includes retail prices and it shows $75 for a standard Northern 4-8-4 with Smoke and $100 for the example with Chug-Chug and Steam Whistle. The version with Chug-Chug and Steam Whistle is silenced as of the 1985 catalog and is missing from the line from that point forward. The 1986 Bachmann catalog refers to the Northern as stock number 41-584-02 and 41-584-16; the 584 identifier appears to be simply a mistake in the catalog as no samples have surfaced with this number on the box and it returns to the 580 number in 1987.